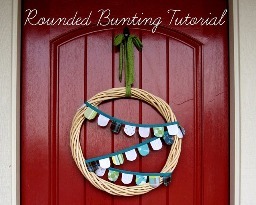 Chris from Pickup Some Creativity shares a tutorial on her blog for making this rounded bunting. It’s cute for any season and any holiday. (See her fall version and her Christmas version.) Make it to hang from your mantle, or make a mini-version to wrap around a wreath. Get the tutorial.